Because the composition of this rock is dominantly quartz one might be inclined to call its QFL quartz. 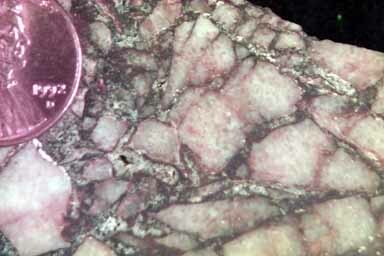 Technically, however, the breccia fragments are quartzite, a metamorphic rock. Therefore, we classify this as a lithic breccia. Sawed slab of rock. Angular gravel particles in the granual size range (4-64 mm) with a quartz sand matrix. Breccia fragments are composed of quartzite (metamorphosed quartz sandstone). A close look at the composition of the breccia fragments will show the individual fused quartz sand grains that compose the quartzite.